Apples, walnuts and cinnamon. What could ever go wrong with that combination? Nothing. Especially in the muffins. 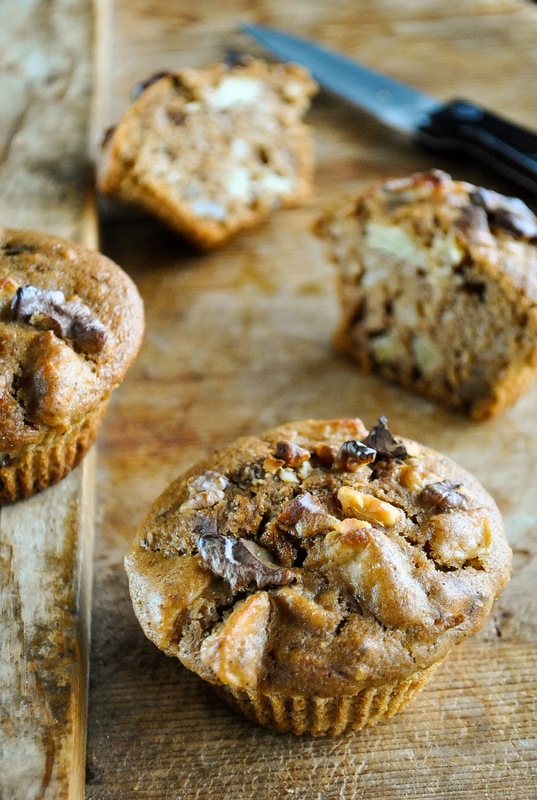 I almost always have apples in my home, so it was a no-brainer to add them to the muffin dough. And where's apple, there's cinnamon. For sweetening, I used dark muscovado sugar. I love extra dark sugars for their smell and texture. When I buy a new pack, I always sniff in this amazing fragrance. And if you use muscovado in the muffin dough, it gives a nice caramel color. Usually, when making cake batter, you start with creaming the sugar with butter. 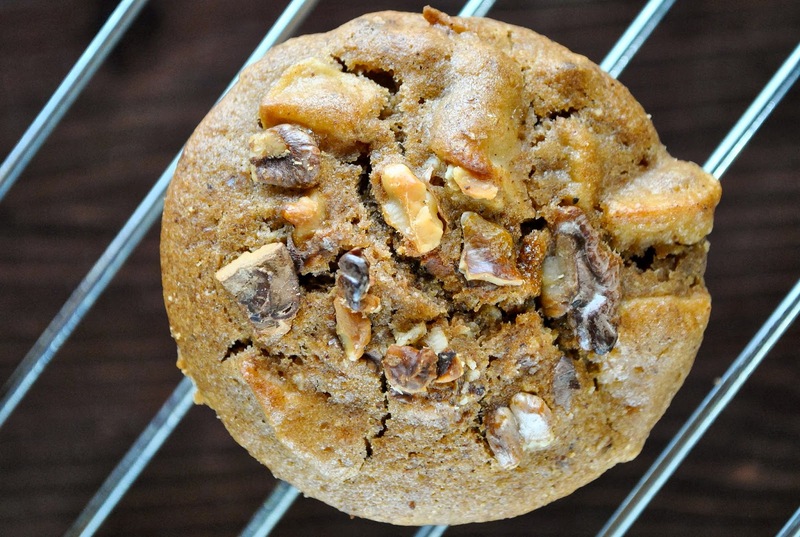 In vegan baking, vegetable oil works great instead of a butter. I mostly use sunflower oil and just whisk it heavily with sugar, until the sugar dissolves. To make the dough rise, you can use good old baking powder. Then add a dash of sour liquid (apple cider vinegar for example) and it will react to the baking powder and helps to rise the dough in the heat. For the main liquid, you can use different plant milks or water, like in this recipe. Sometimes I like to use cherry compote liquids, which will give a nice color and taste. So this is the basic chemistry in vegan baking. Of course you also have to pay attention to the flours you are using, correct ingredient amounts and right baking temperatures. But don't you worry, this is why I made this foolproof muffin recipe. You just heat up the oven, mix the dry ingredients with wet ones and bake. You will have moist, fluffy and tasty muffins. Preheat the oven to 400 F / 200 C. Mix flours with baking powder, salt and cinnamon. In another bowl, heavily whisk the sugar with oil. Add water and vinegar to the sugar and oil mixture and whisk well. Add almost all the chopped walnuts to the dry ingredients. Leave a handful for decorating the muffins. Also add the little apple cubes to the dry ingredients. Fill the muffin tins with muffin papers. When the oven is hot, mix the dry ingredients with wet ingredients. Fill the muffin papers with muffin batter. 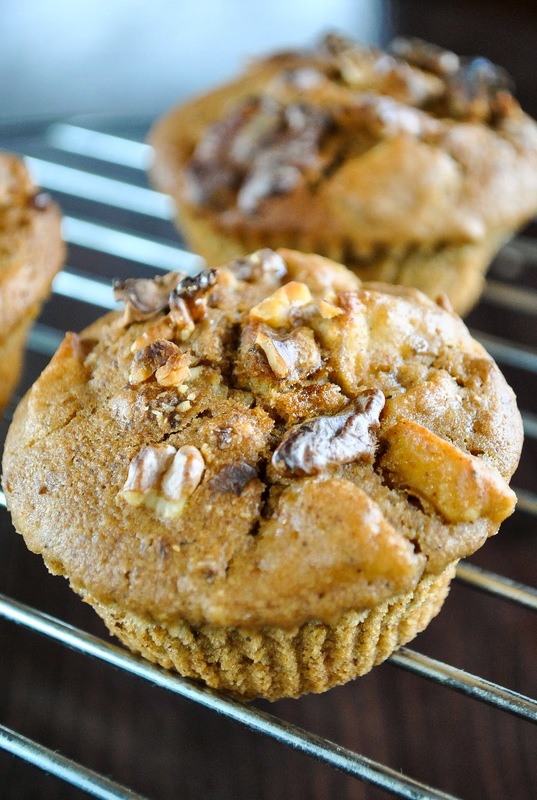 Sprinkle chopped walnuts onto each muffin. Bake for 25-30 minutes. Let them cool a little bit before eating.